How do I prevent Out of Stock Items from appearing on my Product Feeds? If you are using Product Feeds for your items to list them on Shopping Engines, you probably don't want to have specific items listed if they are out of stock. After all, if a potential customer arrives to your store after searching for a specific product - only to find that it's out of stock - that might result in a negative user experience. Fortunately, there's an easy way to have the store automatically set items to hide when they are out of stock. Since hidden items are no longer shown on the store, this function then has the added benefit of omitting the out of stock item from your product feeds altogether. Once there, click on the "General" tab found along the top. Next, look for the "Inventory Control" section and make sure the "Enable Inventory Control" checkbox is marked. Then, select the "Hide Items" radio button directly beneath the Inventory Contorl checkbox. Finally, click "Save" at the top right of the page to commit your changes. 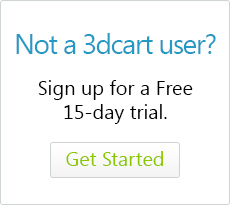 By performing these steps in your 3dcart store admin, products that are out of stock will be hidden from your store. Furthermore, by having the items hidden, they will not appear on your product feed until they are replenished with more stock.